During the month associated with America Recycles Day on November 15, we felt it the ideal time to let you know that Highlight Homes can help you take your next whole home renovation or custom home construction to an entirely new shade of “green.” Ever since our inception in 2005, we have been devoted to environmentally-friendly practices. We are a certified Green Builder, meaning certain criteria must be met and recognized by third-party certification programs such as Leadership in Environmental and Energy Design (LEED), the National Association of Home Builders (NAHB) Green Building Program, Energy Star and Earth Craft House. Highlight Homes has achieved all of these. Our company founder – Tony Pourhassan – has sat on the Board of Directors for the Greater Atlanta Home Builders Association’s Green Building Council, and our sister company – Vesmont, Inc. – has realized a number of unique communities throughout the Southeast that boast an abundance of beautiful Green Space. So – what ARE the latest eco-friendly elements appearing in home construction today? 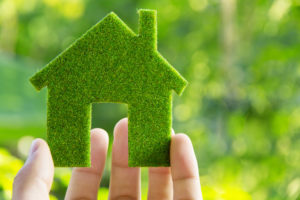 Renewable materials such as recyclable metals, plastics, composites, concrete and more are on the rise in home construction for everything from carpet and countertops to composite lumber and durable steel beams. Reclaimed materials such as distinctive barn doors or the weathered wood from an old structure could lend a lot of character to your home as you do your part to show you have great taste as well as a great desire to save the planet. Plant-based composite materials are growing in popularity among green builders for roofing and insulation. Cool roofing reflects heat back into the atmosphere, rather than absorbing it. Low-E Windows help regulate the temperature inside the home by keeping the heat INSIDE the home during the winter and OUTSIDE the home during the summer. SMART Home controls that aid in the daily management of power consumption through elements like air conditioning and heating, lighting, sound system, blinds, home security systems, garage doors and more – all with the click of a computer mouse or tap of a smartphone. Solar panels and home energy storage through lithium-ion batteries are growing in popularity as ways to battle a global energy crisis at home. Incorporating energy efficient appliances and low flow toilets have become the norm in recent years. There are any number of ways Highlight Homes can help you create the Earth-friendly home of your dreams! We welcome the opportunity to meet with you and discuss your upcoming renovation or custom home construction. Contact us today to schedule your no-obligation consultation by emailing info@highlighthomesga.com, calling 678-873-9234 or filling out our convenient online contact form.